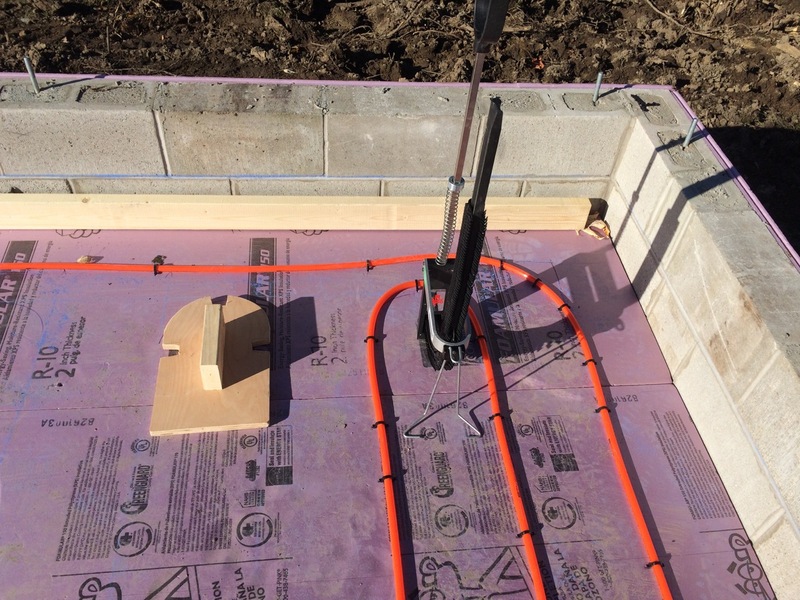 Well, this was it, the big weekend – installing the Pex tubing to create a hydronic heating system for the garage BEFORE the concrete gets poured. 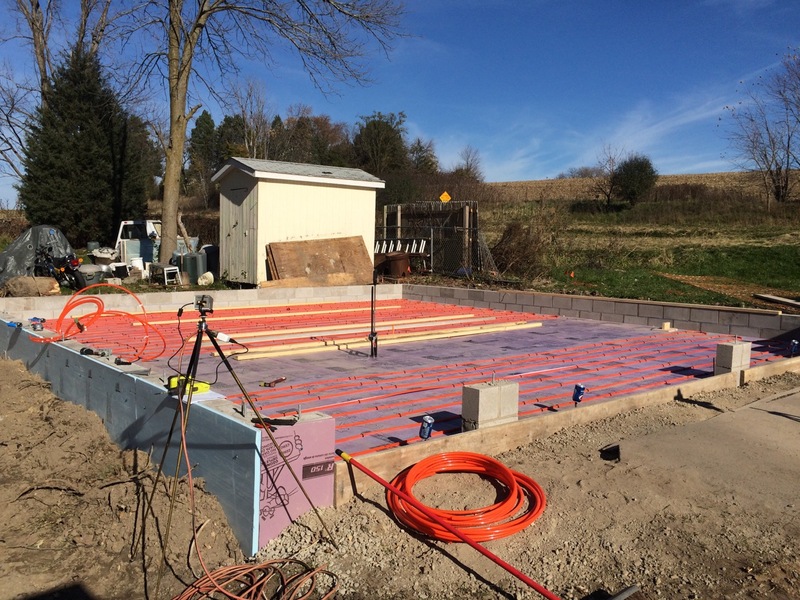 Last week, the mason plowed through the work of trenching, laying the block for the stem-wall, pouring and packing gravel, and then laying down the vapor barrier and foam insulation. It was my job to get all the Pex tubing installed before the mason came back on Monday morning to pour the concrete. So, when I was done with work Friday, I headed to the big box home improvement store to get my materials. I purchased four rolls of oxygen-barrier Pex tubing of the 1/2 inch variety. Three of the rolls were 250′ long, and the last was 300′ feet. I specifically got those sizes because I had run the LoopCAD software to design the layout. Using four loops kept the loops shorter on average. Only one loop exceeded 250′. The spacing for the system is 10 inches between each section of tubing. I also purchased a Watts brand four circuit manifold. It was more expensive than a plain copper manifold (such as would be used for something like just domestic water) but was of higher quality, and had some nice features, such as including built-in flow-meters and temperature gauges. 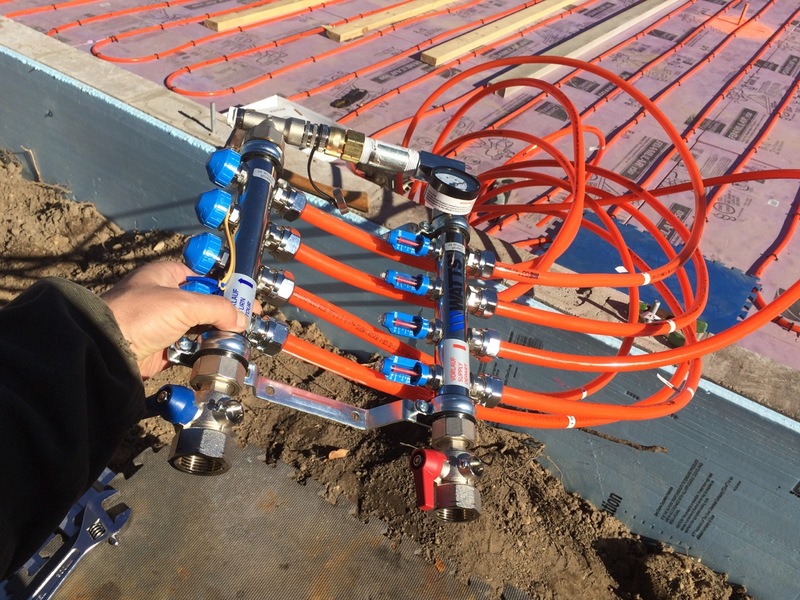 I’d also want to have the manifold handy so that I could pressure test the system BEFORE the concrete was poured. Heaven forbid that there would be a hole in the Pex tubing, but I would want to know that BEFORE it was permanently cast in concrete. Saturday morning, Wayne (my brother and general contractor) got started early. I set up a plastic box for the tubing to run through centered on the west wall. The design was using 10″ spacing, so we snapped chalk-lines 10 inches apart to evenly staple the tubing down to the 2″ rigid extruded polystyrene insulation. When I was at the store, I also rented a stapler. Pushing down on the large D-ring handle inserts a plastic staple over the tubing and down into the foam. The plastic staples are considerably less expensive than the plastic clips that would be manually screwed down into the insulation. However, the stapler itself cost $250! Yipes!Fortunately, the store RENTED the exact same stapler. Starting with the return end of the tube, we uncoiled a 250′ roll and laid it out over the chalk-line. I stapled the tube down about every two feet and also on the outside edge of each piece of insulation. When we got to the end of the row, the tube would need to bend 180 degrees, and continue back parallel to itself for the next row. The tubing itself is actually rather stiff, and pretty hard to bend into a 10″ half-circle. Planning ahead for that, Wayne had already made a jig from a piece of scrap wood. The jig includes three cut-outs for the stapler, and a half-moon shape to bend the tube around while stapling it. The first circuit made three full loops, plus the send and return runs. We ran the second end of the tube through the plastic floor box and pulled out about six feet before cutting the extra off. I’m not yet sure exactly how high up the wall I want to mount the manifold. And without even having a wall in place yet, I have no convenient way to mount the manifold, so we felt it best just to leave plenty of extra tubing. Pleased with our success on the first circuit, we repeated the unrolling and stapling for the next two circuits. This was all right about lunch time, and Wayne had to take off for some other things he needed to get done. I headed off to the store. I also planned to pick up some more 2″ foam for perimeter insulation to go around the concrete to thermally break it from the stem walls. My Dad would be helping out in the afternoon. Also, Monica, the wife of my work friend, Kurt, wanted to come on out to lend a hand and learn about hydronic heat. Once back home, I was now armed with more plastic staples, two more sheets of foam, and Kurt, Monica, and my father all ready to help out. I showed the new afternoon crew how we were laying down the tubing. It was even easier having extra people power. Three of the tubing circuits were already laid out, so we only had to do the final one in the afternoon. I also installed a piece of tube about two feet long for a future temperature probe. I simply duct taped the end that would be in the concrete and left of foot or two above ground level. I also made sure to center the tube between a supply and return tube so that the the sensor should pick up the average temperature of the floor. Next, we needed to install the perimeter insulation. The concrete slab would be 5 inches thick, and the mason had already marked a chalk line all the wall around showing where this would be. The slab would also have a slight slope to it, the thickness of the slab wasn’t just a simple measurement from the top of the stem-wall. To prevent having two inches of exposed foam all the way around the perimeter of the finished slab, I decided to cut the foam on a 45 degree bevel. The pointed tip of the foam would come up to just even with the top of the slab. That way, there would be a thermal break all the way around, but the foam would also be completely hidden and protected. My father had is table-saw handy and made quick work of ripping 5″ cuts of angled foam. 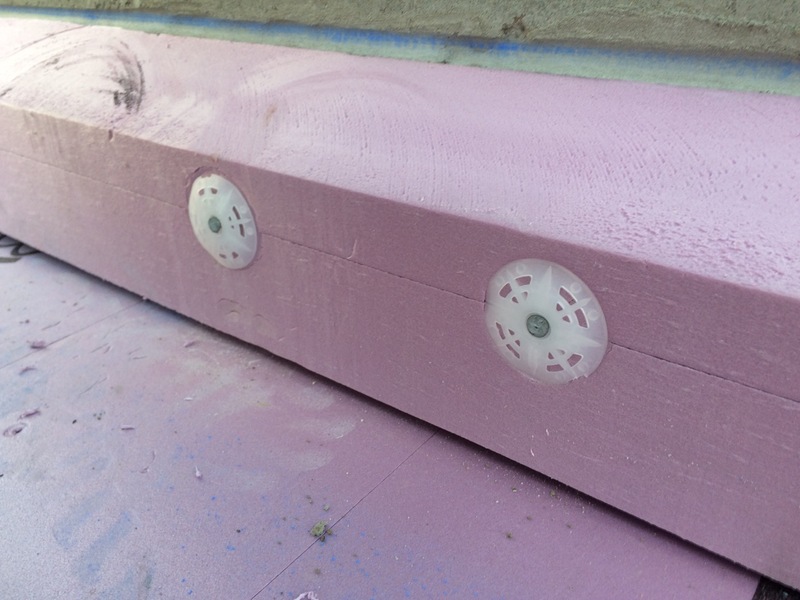 I had accidentally purchased the wrong length of concrete screws, so we instead used some lengths of aluminum wire to pin the insulation in hammer-drilled holes in the concrete wall. We really only needed to keep the foam from blowing away during the weekend and moving when the concrete was actually poured. Working until sunset, (which comes way too early this time of year) we finished the insulation and got the tools all cleaned up. The next day, Sunday, I worked on connecting the radiant heat manifold and pressure testing it. The manifold uses compression fittings. These are easy to work with, as they only require a wrench – no special Pex crimping tool. Also, I found that it was easy to REMOVE the compression fittings. That meant that I could hook everything up, pressure test the system, then remove the manifold so that it’s not in the way while we build the walls of the garage. I connected each of the eight tube ends to the manifold. Each one got a nut and ring slid onto the tube. Next, the fitting would go INSIDE the tube. The ring would slide up onto it. The fitting was inserted into the manifold and the nut would compress it in place. Overall, it was very easy to hook up the manifold. The hardest part was wrestling with the tubing, as it’s rather springy. Next, I threaded a 100 PSI air pressure gauge onto the manifold. It included a a valve similar to a tire stem for me to connect my air compressor and fill the tubing with compressed air. I initially connected it to a garden-hose style connector built onto the manifold which is designed for filling. However, I couldn’t seem to get a good seal there and the built-in valve on the filler was awkward to work with. Instead, I went to the hardware store to get a 1″ to 3/4″ adapter and then connected the air gauge to one of the main connections of the manifold. That also had a nice easy to use ball valve right where I wanted it. Finally, I could put air in the tubing. It took a while to do. 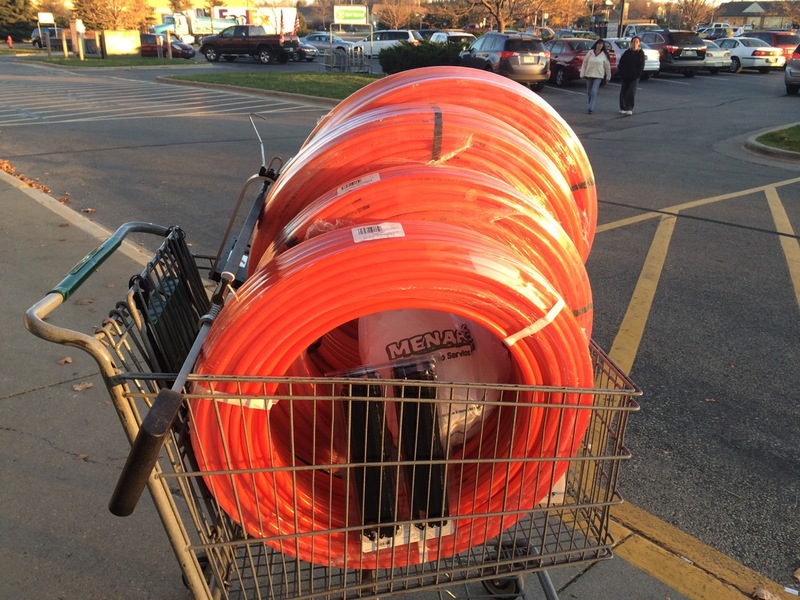 The total volume of the tubing is something like 8 gallons. I put in 50 PSI, then closed the ball valve on the manifold. I listened for any hissing air leaks, but couldn’t find any. Looked like I did a fine job connecting the Pex to the manifold. With that, all I needed was a few trucks full of concrete. Unfortunately, I would be working out of town all the next day, and would miss the fun of the actual concrete pour. I begged my wife to have her camera handy and take photos of it while I was gone. So, how did the concrete pour go? To find that out, you’ll have to stay tuned for the next installment of my Solar Garage Saga.